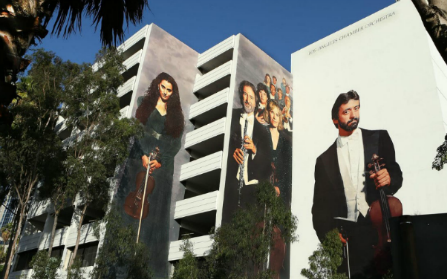 In today’s vernacular, you might say that Kent Twitchell’s public art projects have gotten millions of hits. For decades, people have driven by, walked by or simply sat and stared at huge murals that have dominated LA’s freeways and cityscapes. The murals are there to be seen and, unfortunately, to be affected by the ravages of time and the unintended consequences of progress. Steve McQueen. Ed Ruscha. The Freeway Lady. Marathoners. In a recent article for Cal State Los Angeles’ magazine Los Angeles, Twitchell states: “I wanted [my art] to be outside where real people are, and to be a part of real life.” In his interview, the audience found why Twitchell feels so strongly about the importance of public art, his education at CSULA, his co-opting of buildings as canvasses, and his deeply-held belief that art should be egalitarian. Twitchell’s documentation was sponsored by Meg & Jim Easton. The AfterGlow was hosted by Kevin and Christine Beirne.